Nana Cardoon is a beautiful garden-based learning center serving the Forest Grove area. 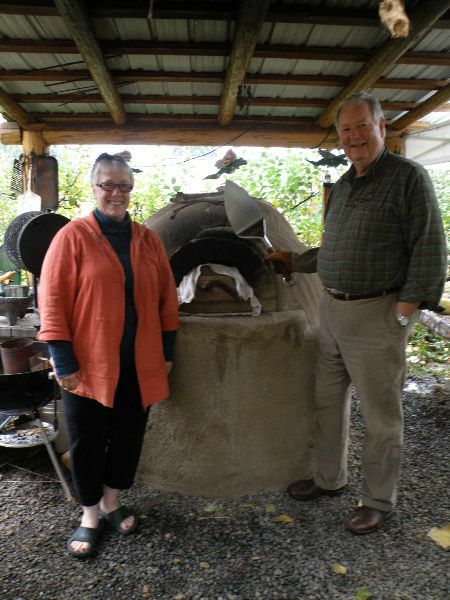 Charlene Murdock and Richard White share a full range of food knowledge and experiences. Their programs and events draw upon their cultural histories while honoring their connections with peasant farmers around the world. You feel like you are in Italy when you step onto Nana Cardoon’s grounds. Richard and Charlene are excellent chefs so the food will be wonderful! We always love going to Nana Cardoon. Please join them. This workshop covers in 4 hours what it takes sometimes days to cover in other Soil Food Web oriented workshops. The material is essential to understanding how and why the dominant NPK paradigm and synthetic chemical practices work against a durable agricultural future. The microherd is our ally as we move away from inexpensive petroleum inputs. Cutting edge information is unique and guides informed organic and biodynamic practices. Soil tests showing the success of these techniques will be shared. Harry continues to promote what is still considered too controversial by those who embrace the conventional, even as that thinking is practiced in much of organic agriculture. Harry has been working with grains, beans, and seeds on a homestead scale for 40 years. During the past 7 years the research plots at Sunbow Farm have been a large part of the drive to create the Southern Willamette Valley Bean and Grain Project. Some of the plot plantings have included black, pinto, soy, lentil, red and garbanzo beans, over-wintering peas, 3 rye varieties, 2 triticale varieties, 4 wheat varieties, 2 varieties of quinoa, amaranth, buckwheat and sunflower and will all be demonstrated during this workshop. -Nutritional measurements, the WSU work we participated in, and current measurements protein etc. Harry MacCormack and Sunbow Farm have been saving seed from many varieties of plants for 4 decades. Homestead scale seed saving is challenging and fun.This class will cover what he has learned. -Open Source, open pollination; can hybrids be redeveloped? -Planting your garden(s) for seed collection. -Water(how much, how little) and other moisture concerns. -Plant identification, marking, how many plants? -Cleaning: equipment you probably need and might already have. -Tricks when processing various seeds. -Establishing a seed collecting community. FEE: $30 per person for each class. Cash or Check. REGISTER: contact Charlene Murdock charlene@nanacardoon.com Directions will be provided upon registration. A beautiful lunch is provided for $5. Please indicate if you would like a lunch. This entry was posted in agriculture, beans and grains, education, farm, land use, Local food, seed saving and tagged beans and grains, edible seeds, education, farm, living soil, local farms, Local Food, seed saving, Willamette Valley. Bookmark the permalink.